The Heliopan 95mm Screw-in Rubber Lens Hood is designed to prevent unwanted stray light from entering a lens by extending and shading its front end. This prevents lens flare and improves image contrast. In addition, since the end of a lens is extended when using a hood, you also get the benefit of extra protection from accidental impact to that lens's front element. This lens hood is constructed with a rubber compound that is UV and temperature resistant, and the rubber material can be rolled back for storage or to convert the hood for use with wide-angle lenses. By rolling back the lens hood, its opening can be made to correspond with a wide-angle lens's angle of view so that vignetting is avoided. A metal mounting ring connects the hood to a lens with 95mm filter threads and a 0.75mm thread pitch. The mounting ring also features corresponding 95mm front filter threads which can be used to accommodate filters, lens caps, or other threaded accessories. 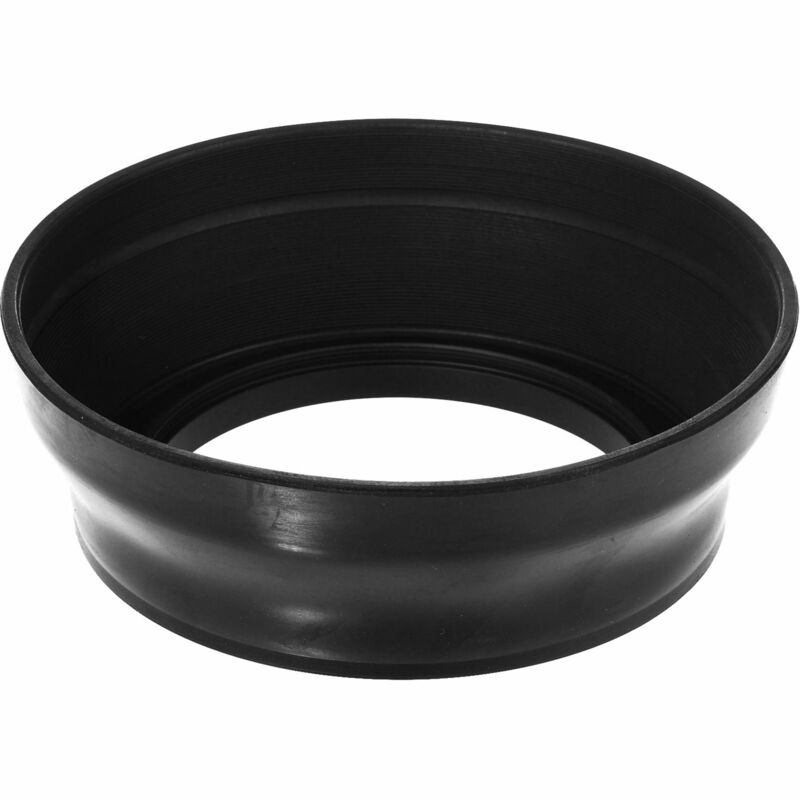 Box Dimensions (LxWxH) 5.3 x 5.3 x 0.8"
95mm Screw-in Rubber Lens Hood is rated 4.3 out of 5 by 3. Rated 3 out of 5 by John from Nice Hood But Pricey I ordered this hood as it was the only available option for a wide angle lens I own with 95mm filter threads. 5 stars to B&H as always for customer service and prompt shipping. The hood is well-made and it is doing its job for me. But I own similar rubber hoods for other lenses that are made equally well and cost only a fraction of what this hood cost. So while the hood functions well, in my opinion it is overpriced. Hence the lower rating based on value not quality. Rated 5 out of 5 by Ashley from Decent It's a rubber hood - it works. :) Note that this does not fit the 82mm Genus Fader Filter (which states that it has a 95mm front thread). Get the Genus brand hood instead. Rated 5 out of 5 by Philip from Solidly Built Lens Hood The 95mm hood is very solidly built, robust hood that threads very smoothly onto the lens. It weighs 86g, and collapses to a disk that packs nicely in the camera bag. If this lens hood is used on the Sony FE PZ 28-135mm f/4 G OSS Lens with an UV Filter attached, will it cause vignetting ? It depend on the sensor but we will assume you have this on a FE camera which would be most likely to cause vignetting. However, with a 28mm wide end, we do not see vignetting to be an issue with a filter or this hood. How deep is this hood? About 5 inches and it is well versed in the works of Kant and Aristotle. Does this hood &ldquo;extend&rdquo; or is it only 0.8&rdquo; deep? Want to use on a Tamron 150-600 for easier traveling than the one provided. Do it fit to this lens: Tamron SP 150-600mm f/5-6.3 Di VC USD? While the Tamron 150-600mm lens does come with a lens hood, you could use the Heliopan 95mm screw in lens hood with 150-600mm if you prefer.